Having finished the first quarter with a win, we are looking for more of the same as we start the second round of fixtures with two home games in less than a week. We welcome Morton on Tuesday but start the games against Championship bottom side, Falkirk tomorrow. During the first set of fixtures we travelled to the Falkirk Stadium in August when Stephen Dobbie walked away with the match ball, thanks to one of his four hat-tricks of the season. As he looks back on last week's victory over Dunfermline and ahead to this week, boss Gary Naysmith is hoping to make home advantage count. "Not only was I delighted to pick up the three points from our game against Dunfermline last week, but I was also delighted with the disciplined performance from the players. We had a game plan in place that we had worked on in training and the players stuck to it for the full ninety minutes and came away with a big three points. It was a great response from the previous week when we were well below our best at East Fife. We were well organised, difficult to break down and also looked a threat on the counter attack. Our goal was a well worked counter attack and ended with a cool finish from Josh after a great through ball from Adam. We also kept another clean sheet and that is now five from nine league games which is fantastic. 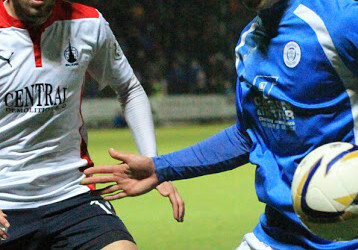 This week we have two big games at home against Falkirk and Morton. We will take each game as it comes as in this league you really can't look too far ahead. So we have been working towards the game against Falkirk, with them sitting bottom of the table, Ray will be looking to start clawing back points. It will be a different game altogether but our game there back in August when Stephen Dobbie scored a hat-trick was one of our best performances of the season. As I've said previously we haven't lost too many games at home recently but we have had a lot of draws, so we need to keep building on last week's result and look to start a consistent run of taking three points from the games, especially at home. Please get behind the team and continue with the backing you have given the players already this season, it does make a difference. Gary Harkins and Darren Brownlie are both progressing but are still missing for this one. Everyone else is fit and available for selection". Visiting fans should note that sections six and seven in the BDS Digital (East) Stand have been set aside for them. Turnstiles three and four will be in use for them to gain entry. The catering outlet and toilets in the BDS away side will be available for use. Catering is also available in the Arena café where a full menu is available before kick-off. The bar under the Gates Stand will also be open for refreshments. Away spectators should attend from King Street direction as the segregation tunnel will be deployed. Entry is by ticket only. The Arena ticket office will be open for away supporters from around 11:30 with the BDS Stand away ticket office opening about 1pm. There will be on street parking restrictions, therefore it is suggested that buses/minibuses drop off their passengers in Terregles St/King Street and thereafter park on College Mains road just off the roundabout with the A76 on the town bypass (adjacent to Curry's/PC World, as the other side at Aldi is the access road to the ambulance depot and is extremely busy). Pick up should be the same location. There are no known roadworks around Dumfries that would affect travel times to Palmerston Park however fans should check the Traffic Scotland website at http://trafficscotland.org/index.aspxfor confirmation and of any other delays. With it being a home game we will be running our usual Saturday club for primary school children at the Arena from 12.30. Ten pounds per child or £8 for junior blue ticket holders, the kids can have two hours of fun during training and games before having lunch and then heading over to watch the game with their match ticket that's included in the price.